Join us for a BASFF 2017 event featuring me (series editor John Joseph Adams), 2017 guest editor Charles Yu, plus BASFF 2017 contributors Leigh Bardugo, Brian Evenson, and Greg van Eekhout. We’ll be starting off with a panel discussion (moderated by Christie Yant), followed by a signing. 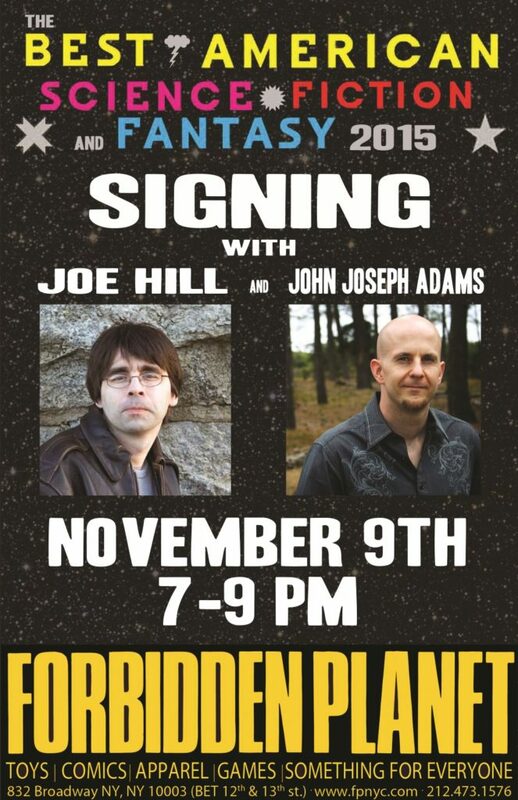 Best American Science Fiction and Fantasy 2015 event: Discussion, Q&A, and Signing, featuring series editor John Joseph Adams, guest editor Joe Hill, and contributors Seanan McGuire, Carmen Maria Machado, and Jess Row; moderated by David Barr Kirtley of The Geek’s Guide to the Galaxy. EVENT: Reading/Signing Oct. 10 @ Barnes & Noble in Ventura, CA, Feat. John Joseph Adams & Contributors Sofia Samatar & Kelly Sandoval!